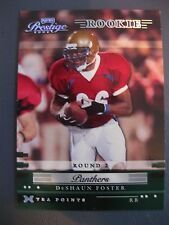 Near mint condition 2002 Bowman #135 DeShaun Foster rookie card. BUY ONE CARD GET ANOTHER CARD FREE! BUY ONE CARD GET ANOTHER CARD FREE! THES E CARDS ARE IN MINT TO NR-MINT CONDITION. item description: 2002 rookie auto autograph #d/1200 college !!. COMBINED SHIPPING AVAILABLE AT 75 CENTS PER EACH ADDITIONAL SINGLE CARD AFTER THE highest shipping item won WHEN PAID WITH ONE PAYMENT . PLEASE WAIT FOR INVOICE !! . SMALL LOTS SLIGHTLY HIGHER. DUE TO MY WORK SCHEDULE, I CAN ONLY SHIP TWICE A WEEK, NOT EVERYDAY. PLEASE TAKE THIS UNDER CONSIDERATION. payment due within 8 days of ebay winner notification message. thanks again for looking........& have a great day !!. 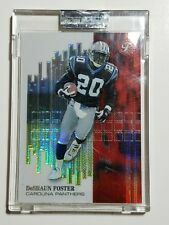 item description: very nice 2002 rookie auto #d/120 !!! . add $3 shipping/handling . combined shipping .75 each additional single card on top of your highest shipping item won when paid with one payment!!! . please wait for invoice!! . small lots slightly higher . DUE TO MY WORK SCHEDULE,I CAN ONLY SHIP TWICE A WEEK,NOT EVERYDAY.PLEASE TAKE THIS UNDER CONSIDERATION. please do not bid if you are not willing to pay. payment due within 8 days of ebay winner notification message. paypal accepted TO CONFIRMED ADDRESSES ONLY!!. thanks again for looking........& have a great day !!. item description: 2002 rookie jersey, college, #d/1499 !!. COMBINED SHIPPING AVAILABLE AT 75 CENTS PER EACH ADDITIONAL SINGLE CARD AFTER THE highest shipping item won, WHEN PAID WITH ONE PAYMENT . PLEASE WAIT FOR INVOICE !! . SMALL LOTS SLIGHTLY HIGHER. payment due within 8 days of ebay winner notification message. thanks again for looking........& have a great day !!. item description: 2002 rookie jersey pennant die cut, college worn !!. COMBINED SHIPPING AVAILABLE AT 75 CENTS PER EACH ADDITIONAL SINGLE CARD AFTER THE highest shipping item won WHEN PAID WITH ONE PAYMENT . PLEASE WAIT FOR INVOICE !! . SMALL LOTS SLIGHTLY HIGHER. payment due within 8 days of ebay winner notification message. thanks again for looking........& have a great day ! !.